I love cooking with the George Foreman grill. I make sure I cook something healthy at least once a week with it. However, having to clean the grill afterward can be really frustrating. If you’ve ever seen a George Foreman grill, then you know that the cookware has 2 grilling surfaces that close together like a clamshell. Your meat, veggies, or whatever else you want to cook up is sandwiched between the 2 grill plates to cook up a crisp, tasty meal. A huge benefit of cooking with the “Lean, Mean, Grilling Machine” is that it grills virtually all the fat out of your food and forces it into a drip pan. While it’s safe to put the plastic drip pan into the top rack of a dishwasher, cleaning the grill itself is another story. While newer George Foreman grills have removable grilling plates, mine does not. 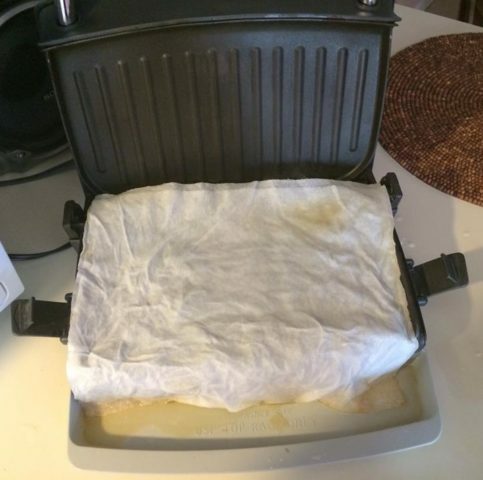 This is, hands down, one of the best ways to keep your George Foreman grill clean. You simply lay 1 long piece of aluminum foil across the 2 grilling surfaces. Two separate, shorter pieces work, too — but you’ll have to make sure both pieces are perfectly centered so neither grill plate is bare or grease won’t drip under one of the foil layers. You can safely use the foil on the grilling surfaces to thoroughly cook your food, using the same cooking times as you would ordinarily follow if you were grilling your food without the foil. When you’re done grilling, simply remove your food and turn the grill off. Then, once the foil has cooled off, lift the foil off the grill plates (be careful not to drip any back onto the grill!) and throw away the foil. 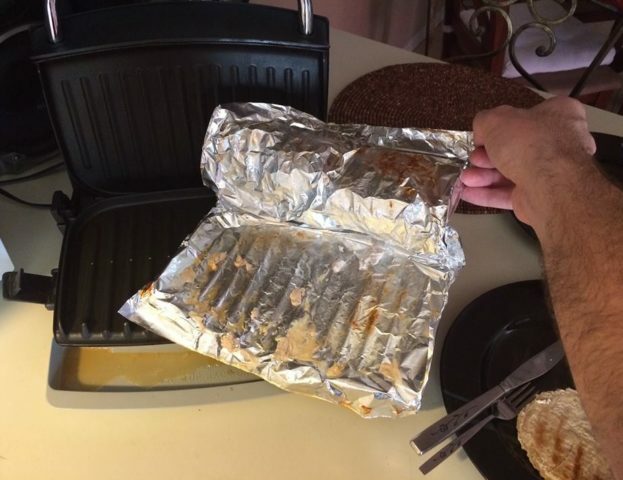 The only downside to using foil on your George Foreman grill is that you don’t always get those fancy-looking dark brown grill marks – you know, the ones that make grilled food looked grilled? As you can see in the photo above, I did happen to achieve a few uneven grill marks on some turkey burgers that I made with the foil-topped George Foreman grill. But, if you want nice, even grill marks, you may not want to use the foil method. Voila! Cleaning your Foreman grill is as simple as not getting it dirty in the first place — by lining the entire cooking surface with aluminum foil. I hear that parchment paper works equally well on the George Foreman grill, but I haven’t tried that method yet myself. 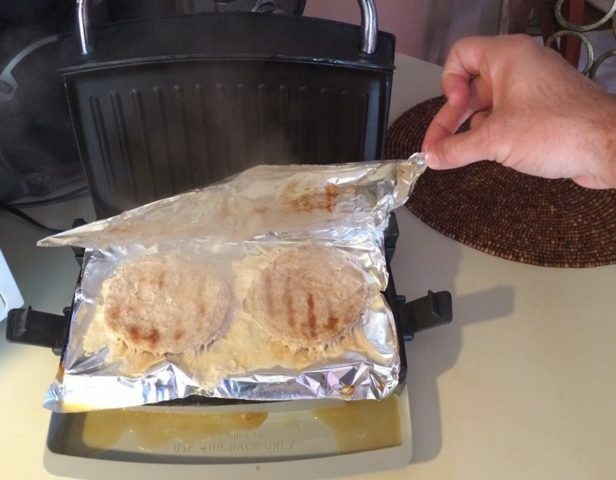 Want to make cleanup of your George Foreman grill easier without using foil or parchment paper? I like to place damp paper towels on the grilling surfaces after I’ve finished cooking to help lift the grease. Grill your food on the George Foreman grill as usual. Then, after you’re done cooking and the surface has cooled down a bit (but not too much), layer a few lightly damp paper towels on the grill plates and close the grill. TIP: Make sure you unplug the grill before placing damp paper towels onto the grill plates. Anything wet near an electrical appliance that’s plugged in could cause a shock. Let the paper towel absorb and loosen the grease while you’re eating. Once you’re ready to clean up, remove the damp paper towels from the grill plates. Then, use mild dish soap and a wet rag to wipe away any remaining residue. Sometimes, the steam from the paper towels is so effective at removing everything, you don’t even need soap & water! IMPORTANT: Do not place paper towels across the surface when the grill is still very hot. This could cause a fire. Instead, let the grill cool down to the point that it is still a bit warm, but not anywhere near as hot as when you were grilling your food. The mild warmth, along with the moisture in the paper towels, is a necessary combination for gently lifting away the grease left behind on the grill plates. Then, after the grilling surfaces have cooled, wipe the grill plates using a moist rag or a wad of paper towels lightly laced with mild dish soap. Use the plastic scraper that came with your George Foreman grill to clean the grill plates and lightly chip away chunks of fat and food left behind. Some gentle scrubbing is enough to remove the remaining grease, leaving behind a lean, mean – and CLEAN – grilling machine! 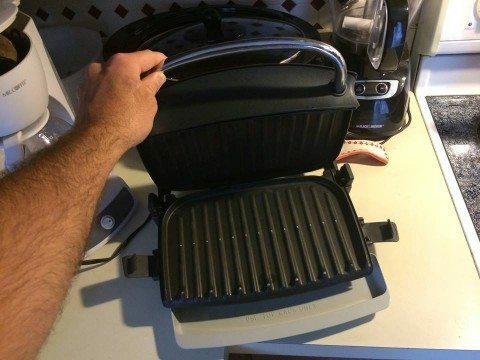 What Is The Best Way To Clean A George Foreman Grill?